In March 1909 Britain’s First Lord of the Admiralty. Sir Reginald McKenna, told Parliament that German naval construction presented a grave threat to the British Empire. Unless Britain radically increased her naval spending, she would be at the mercy of the High Seas Fleet. Some quiet spending by the Vickers-Armstrong arms combine helped ratchet up the noise level. 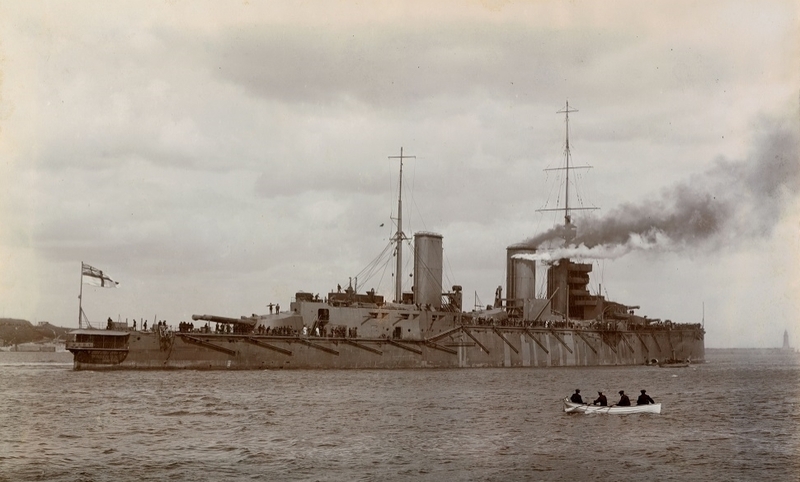 The popular press picked up the slogan, “We want eight and we won’t wait!” shouted by Unionist Member of Parliament George Wyndham during the debate following McKenna’s pronouncement, referring to the number of dreadnought battleships to be laid down in the coming fiscal year. The Admiralty’s 1908 budget called for two new dreadnoughts; Lord Cawdor, a former First Lord of the Admiralty himself and Wyndham’s own party leader, had recommended four. McKenna had “only” asked for six. Now the demand jumped to eight. The jingo press in the Dominions – Australia, Canada, New Zealand and the nascent South Africa – also pushed for the massive increase, urging their governments to participate. 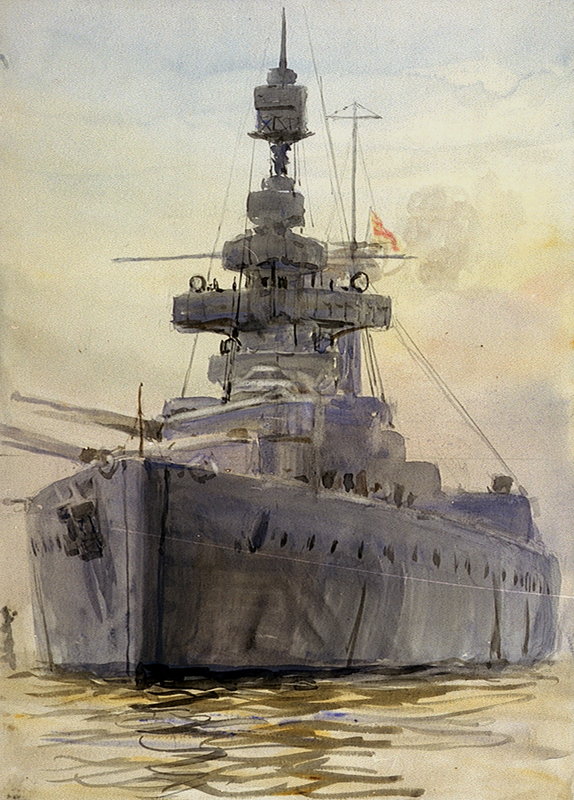 Australia and New Zealand each offered to pay for a new dreadnought, and First Sea Lord Sir John Fisher seized the moment to propose that each of the larger dominions (excluding Newfoundland) build a “Fleet Unit” of one armored cruiser and four light cruisers, to serve as a nucleus of a dominion navy during peacetime and come under British command during war. Fisher always intended that the core of each Fleet Unit would be a battle cruiser, but used the “armored cruiser” wording to allow the proposal to be presented as a set of five cruisers. Eventually Australia accepted the proposal, with the provision that one cruiser would be built at Sydney’s Cockatoo yard, while New Zealand stuck with the offer to fund one dreadnought, which Fisher successfully diverted to a pledge for a battle cruiser. The battle cruisers would be repeats of the Indefatigable of the 1908 program; though the much more capable Lion had been laid down by the time the Dominion ships began construction, Fisher feared they might back out of their commitments if presented with the much greater price tag of a Lion. South Africa declined to participate, but in Canada a debate broke out over not whether to provide ships at all, but rather over the level of participation. Prime Minister Sir Wilfrid Laurier presented a Naval Service Bill in January 1910 calling for establishment of a semi-independent naval service (controlled by Ottawa in peacetime, by London during war) with a naval college in Halifax and a new squadron of five cruisers and six destroyers. English-speaking Conservatives derided the Laurier bill as not doing enough to support Britain, while French-speaking Nationalists feared it would drag Canada into all of Britain’s wars and lead to conscription to man the ships and shore establishment. Progress came slowly; the Royal Navy transferred two ancient cruisers to the Canadians for training but no orders came for the five cruisers as debate erupted over where they should be built. Pro-British jingoists, spurred by Vickers-Armstrong, wanted them ordered immediately in British yards while others insisted that Canadian spending should generate Canadian jobs. Robert Borden, the Conservative leader, scorned Laurier’s proposal as a “tin pot navy” (despite the presence of his cousin, Sir Frederick Borden, in the Liberal cabinet as Minister of Militia and Defence). The Tories ran their 1911 campaign in favor of simply paying Britain to build more dreadnoughts, as well as a harsh stand against Laurier’s proposed free trade agreement with the United States. Those stands, and a virulently racist “White Canada” anti-immigrant message, brought Borden into office and scuttled Laurier’s cruisers. Prodded by Winston Churchill, Borden offered instead a Naval Aid Bill for a one-time cash grant of 35 million Canadian dollars to fund construction of three dreadnoughts in British yards, for the Royal Navy. They would have been Queen Elizabeth class fast battleships, slightly modified, and have borne Canadian names (Quebec, Ontario and Acadia) but otherwise would have been Royal Navy vessels like any other. Borden’s bill faced stiff opposition in the Canadian Parliament, which objected to a straight cash grant of Canadian money that would create no Canadian jobs. Borden terminated debate on the bill, the first time a prime minster had invoked that power, but the Liberal-dominated shot it down two weeks later. Borden’s overreach assured that while New Zealand and Australia each provided a battle cruiser and the Federated Malay States funded a Queen Elizabeth-class dreadnought, Canada made no meaningful contribution to the Royal Navy before the First World War broke out. The Lion-class battle cruiser Queen Mary; the Canadian ship would have been similar. Fisher, for all of his bluster, had read the political situation better than Churchill. The “Fleet Unit” concept appealed to local pride, and by including smaller warships some of the contracts could be placed locally without arousing as much opposition from Vickers-Armstrong. Had Laurier prevailed, Canada would have made a direct contribution to the Empire’s naval forces. Given the eagerness to spend even more for dreadnoughts, the Canadians would not have balked at the expense of a Lion rather than an Indefatigable (as it stood, Fisher and McKenna were likely overly cautious in ordering the cheaper battle cruiser design on the Dominions’ behalf). The four light cruisers would been Town-class ships, like their Australian counterparts. The Australians built their battle cruiser in Britain (in the private yard of John Brown in Clydebank) and the Canadian battle cruiser would have been built in a British yard as well. Two of the four Australian cruisers were built by Cockatoo in Sydney, but the Canadian Vickers shipyard the Laurier government had encouraged the arms maker to open in Montreal (an offer sweetened with tax and land incentives) would not be operational until 1914. Halifax Graving Dock did not begin building large ships until after the Great War; much of their facility was blown up in the 1917 Halifax Explosion. Following the Australian example, Canadian nationalists would have pressed for at least two of the smaller cruisers to be built in Canada, even if it greatly delayed their commissioning. Imperialists would have demanded that all five ships be ordered in British yards to assure rapid delivery. It’s entirely possible that this political contest would have scuttled the entire project. We avoided that question in Golden Journal No. 26, which includes all five of Laurier’s Canadian cruisers as well as a variant adding them to Cruiser Warfare. A modern Canadian squadron in the North Atlantic would have greatly changed British deployments, allowing them to retain the Lion-class Princess Royal in the North Sea rather than dispatch her to Halifax. Or they could have formed a powerful task force able to locate and destroy Graf von Spee’s squadron all on their own. You can try those variants out for yourself. Join the Gold Club and order Golden Journal No. 26: Armored Cruisers.